All award winners of the International Eckart Witzigmann Award 2007 have one thing in common: their creative work goes far beyond what can be denoted as craftsmanship, and yet they are perfectly expert in their individual craft; on the basis of this craft, however, they have each been able to place emphasis on unique aspects and have thus created art in many different ways. They continued the series of prominent award winners of the past, such as Ferran Adrià, Marc Haeberlin, Thomas Keller and Günter Grass. Born in Loffenau bei Baden-Baden, has long ago reached the pinnacle of the art of cookery as the head chef of the “Schwarzwaldstube” of the hotel “Traube Tonbach” in Baiersbronn. Even the Gault & Millau, which already declared him “Cook of the Year” in 1991 and also accords him the highest ranking in its 2007 edition, is moved: “Describing his performances of pleasure is as hopeless an endeavour as describing music in words.” Harald Wohlfahrt completed his cooking apprenticeship between 1970 and 1973 in “Mönchs Waldhotel” in Dobel, whereupon he then worked from 1974 to 1976 as commis chef at the “Stahlbad” in Baden-Baden, which has two Michelin stars, under Willi Schwank. The year 1977 led him to Eckart Witzigmann in Munich at “Tantris”, before he became deputy head chef at the newly opened “Schwarzwaldstube” of the hotel “Traube Tonbach” in 1978. And he remained loyal to the restaurant: in 1980, after an internship with Alain Chapel in Mionnay, he became head chef at the “Schwarzwaldstube”. Wohlfahrt’s straight and yet meteoric career ascent has been accompanied by numerous prizes. He was already accorded three Michelin stars in 1992; in all the well-known restaurant guides he has the leading position, in the gourmet magazine “Der Feinschmecker” as well as in the Aral Gourmet Atlas. 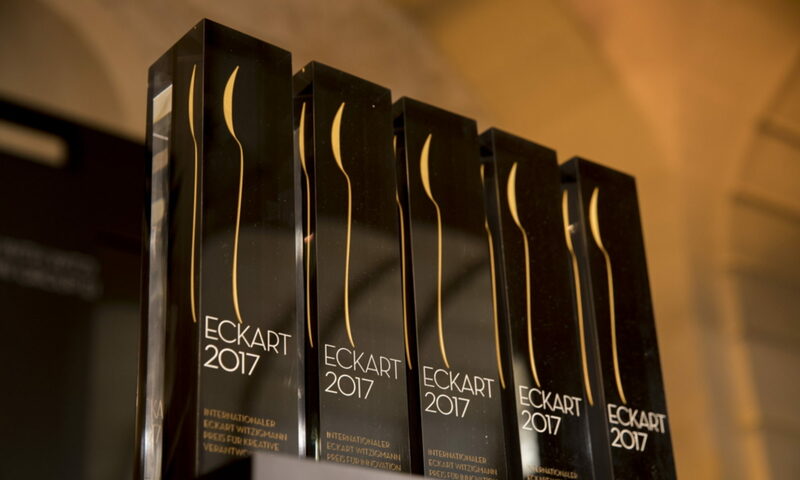 After Eckart Witzigmann, he is only the second cook in Germany who has been awarded the “L’Art-de-Vivre honourary prize” for his high art. Other prizes were not long in coming: in 2002 the Medal of Merit of the state of Baden-Württemberg, in 2003 the Medal of Merit of the Tourism Association and in 2005 the Federal Cross of Merit. Harald Wohlfahrt, no one doubts it, has set standards in culinary arts. When everyday reality is elevated to be art, there arise new ways of seeing, new perspectives. The perceiver’s horizon is expanded. Daniel Spoerri himself, world-famous as an artist, calls himself in modest and self-deprecating fashion a “universal dabbler”. What hasn’t he done in his life: he was a bookseller and a fruit seller, waiter and ballet dancer, choreographer and actor, director and literary figure, publisher, co-founder of the Nouveau Réalisme group in Paris, cook and host, philosopher and roamer among worlds, styles and genres, also runs a restaurant and the “Eat Art Gallery” in Düsseldorf, as well as an art garden near Seggiano in southern Tuscany. Daniel Spoerri created the impressive symbiosis of the art of cookery and visual art. As homo ludens and homo faber, as a playing and creative person, as a connoisseur of the art of living, he has himself become a work of art, his very own completely original work of art. Jonnie Boer has helped not only his own name but also his country’s to become synonymous with culinary harmony – practically singlehandedly. If you take into consideration that just five years ago not a single Dutch restaurant was decorated with three Michelin stars, he has ensured with tenacity and talent that that has changed: in 1993 he received for his art of cookery in the restaurant “De Librije” (The Library) in Zwolle, where he had already worked as an apprentice, the first star, in 1999 the second and in 2004 the third. Gault & Millau awards him 19.5 of 20 possible points. That he transformed the former monastery to an outstanding and recognised restaurant, that in July 2007 he was engaged as guest chef at the restaurant “Ikarus”, Hangar-7, Salzburg – this all shows that he has been recognised and respected far beyond the borders of his home country in the meanwhile: an ambassador of taste. One secret of his success, besides his brilliant creativiy, is how firmly his feet are planted on the ground: he does not need to buy his products in France and Belgium to meet international standards; rather, he procures them himself in the neighbourhood. This does not at all mean, however, that he works provincially. He cares little for what others consider chic and “in”, he relies on his own style – and his guests thank him for it. He does not style himself a sophisticated interpreter of his own creations. He wants to convince, not to persuade. Succinctly, he calls his first cookbook “Pure”, the second one “Purer”. We know the name of the third one: “Purest”. You can’t get any better than that, nor can you climb any higher. If proof were at all necessary that great cooking crosses not only country borders but also entire continents, it is provided by the Japanese chef Hiroyuki Hiramatsu. After training in France he opened his first restaurant in Japan in 1982 – building in this way a culinary bridge between Europe and Asia. He uses this bridge not only by offering specialties with French characteristics in his Tokyo restaurant in the cosmopolitan district of Hiroo, specialities such as “foie gras de canard aux choux frisés, sauce aux truffes” and “homard rôti aux pousses d’épinards”, but also by founding a restaurant in Paris in 2001 that was awarded a Michelin star just one year later. Today the Hiramatsu Group operates 18 restaurants: a real imperium of the culinary arts. Long ago Hiroyuki Hiramatsu was recognised as an ambassador of the French “haute cuisine” in Japan – and as a Japanese top chef in France he has become an institution. This bridge building is new – yet Hiroyuki Hiramatsu does not style himself a great innovator. Instead he sees himself grounded in a significant tradition – and he bows to the great European role models and predecessors in his metier. This is proven not only by his menu, but also in the furnishings of his restaurant in Tokyo, where the walls are decorated with photos of the great masters of the art of cookery: perhaps as an impetus, but certainly also as a self-imposed obligation.